I never ever ever travel without my steamer. It is my saving grace on the road and it also means I can jam pack my clothes, roll them up, shove them in and not have to worry about wrinkles! Hats were made for summer! They're so fun and great for days at the beach (protecting your skin from the sun is cool guys), for days when you don't want to wash your hair and for days when your outfit needs a fun accessory! My tried and true hat (from J. Crew like a million years ago -- see this post here and my first ever Travel Tuesday post here) is this Panama hat. It's my favorite hat and I'm not kidding when I say it goes with everything. As for true straw hats, I recently just bought this hat because I wanted something more structured. It's a little bit more pricey but it was totally worth it. You can tell it's a high quality hat and something that I'll have for many more years to come. This hat will be my next purchase. Coming in at $48 it's a steal and totally worth a try! I also have a rather large head so I'm glad there is sizing available for this one. My favorite thing about summer is the ability to break out my white denim shorts. I wear them like I wear my white pants -- all year round and with everything. I'm not going to try to push some fancy denim shorts your way or ones that are crazy expensive just to make money so trust me when I say these white jean shorts are. my. jam. I mean I even bought a second pair for this summer and I'm trying out this distressed pair as something new too. They're running a little low in sizes but try your local store or check back on the site. They update it all the time with new sizes! We all know of the all-American classic monogram navy and canvas duffle (that I also found comes in red -- so cool) but what about other options? I love this duffle that you can totally make your own (with leather detailing) and this expandable one that comes in a TON of colors. But of course we can't forget about my favorite duffle ... my Keepall! I love this one and take it everywhere. Here are some great secondhand bags for you to look at! I mean what's summer without a really great beach towel? This one has tassels and a fun print. It's the twist on a classic turkish towel, these have come in every color of the rainbow and have stripes (which you know I hate) and this of course is such a classic (and only $34). What are your summer travel essentials?! I know I have tons more but I thought theses were top priorities!! Thank you for sharing your travel essentials! I have a similar steamer and it works wonders too! Definitely a MUST! I also have to bring my portable steamer. Who likes wrinkles? Thanks for sharing. Portable steamers are a life saver! No one wants to vacation in wrinkled clothes! I really need to invest in a good steamer. And who can go a summer without a straw hat and white shorts?! Great list! 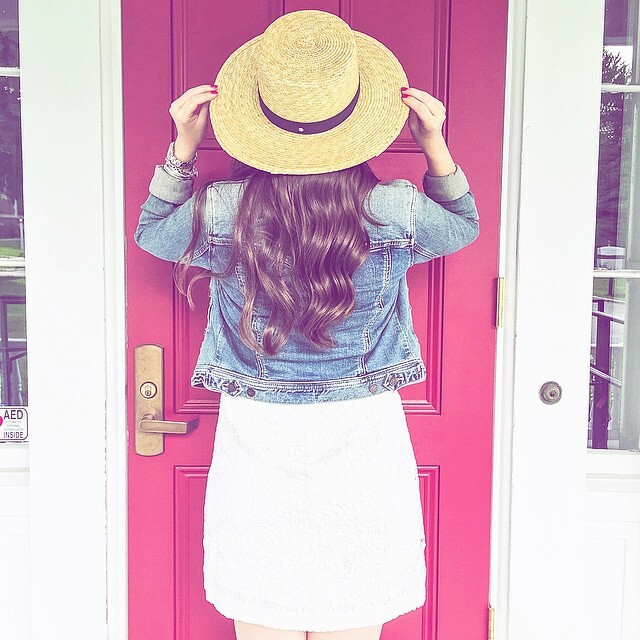 I already own a few sunhats because hiding from the sun is the way to go, but I'm loving your picks as well! Love seeing some of your essentials - thanks again for the great steamer recommendation! I ordered it right after I heard from you on snapchat and am in absolute love with it!! Such a steal!